Ollie & Nic manage to achieve something pretty great. They offer a range of smart, slightly quirky bags that do a great job of looking like leather. Not only that, but they're affordable and actually last as though they are leather. Most non-leather bags start to look tatty pretty quickly. I can't call them my go-to handbag shop because I don't need them to be. I've bought one and it's lasted years despite being used all the time and carrying around all of my junk (why are there three books in my bag today?) I'm consistently impressed by them. 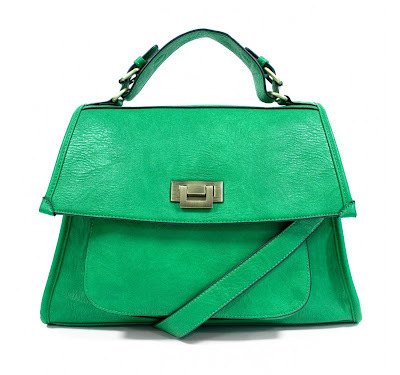 And I'm in instant lust with this green lock bag. It's such a gorgeously rich colour. And actually, if I'd said it was leather, I think at first glance you'd have believed me. Ollie & Nic actually do a leather range (and my heart is aching over this orange tote bag that I can't afford), but this is the bag I'm most crazy at right now. And it's in the sale so it's £40 down from £60. I actually sighed with happiness when I saw this ^_^ I should not be spending £40 on a bag, but.... it's just so beautiful! Pesky Domestic Sluttery readers buying things before me.